discover Heaven and Eternal Life. as it seems and death is not the end. 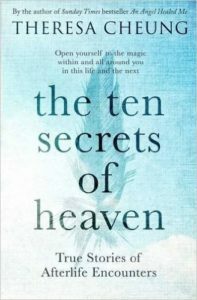 ES: Well, as someone who is areligious yet spiritual, I find your words very reassuring, Theresa, and I can’t wait to read Ten Secrets of Heaven. I know it’s a very busy few weeks for you so thanks so much for taking the time to take part in Hot Holidays! TC: It’s my pleasure, Elaine. Thanks for asking me. 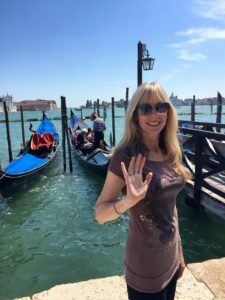 TC: I had the most wonderful holiday in Venice. I chose it as it’s a place I’ve always longed to go as got a fairy tale like quality. And I have to say, it lived up to all my expectations. And I have to add that my Heaven books also very popular in Italy. The photo is of me on that holiday. Theresa on holiday in Venice. TC: My favourite type of holiday is one with lots to do and see to keep me busy. TC: I don’t enjoy beach holidays at all. I find them boring, I’m afraid. TC: This one’s easy: Florida. And it was memorable for two reasons. Number one, Disney World which was magical beyond belief. And number two – I got to swim with dolphins, which was a truly unforgettable experience. ES: I love dolphins. Beautiful creatures. So, it sounds like with Venice and Florida you’ve had some marvellous holidays, but have you had any holiday or travel disasters? TC: Unfortunately, yes, I have. My son was born in the USA and is, therefore, a US passport holder. So on a one of our holidays he travelled on his US passport, but we were told on arrival that we should have taken his UK passport too! So, we had a long journey home and our holiday didn’t happen. ES: Oh, that’s awful! Very disappointing for you all, I’m sure. ES: Theresa, is there a place you long to visit? TC: I’d love to visit Canada. TC: I think from what I’ve seen in films and magazines and on TV the scenery is absolutely breathtaking. I long to go to Alaska too for the same reason. us anymore which is sad but that’s life, I suppose. ES: Now, if I can get a bit personal… Have you ever had a holiday romance? TC: Oh yes! I met a lovely Cypriot while in Greece but on returning back to the UK with him he turned into someone very different. I think holidays just make you see everything with rose coloured specs on. ES: Hmm. I tend to agree that holiday romances rarely work out, do they? How would you spend your dream twenty-four hours if you could travel to multiple, worldwide destinations with no travel or time restrictions? TC: I spend the time between New York, Canada and Alaska – sight seeing, drinking coffee and writing in cafes. ES: That sounds perfect. And finally, Theresa, what tip or piece of advice would you give to holidaymakers and/or travellers? TC: Break out of your comfort zone. Many of us get stuck in holiday ruts and always go to the same place each year but a whole, wonderful, beautiful and exciting world is out there waiting for you to explore it. ES: Great advice! Thanks so much for being with us today, Theresa. And all the best with Ten Secrets of Heaven. I’m off to download my copy now!